One of the most frustrating things about buying airline tickets is that the prices are so erratic. I’m going to Chicago in late September and the price today is $200 less than two months ago. Whatever happened to the early bird gets the worm? As a frequent flier I’ve found five ways to help find the best prices. In general the weekend is the worst time to buy airline tickets, yet that’s when most people are off and able to take care of tasks like this. The best day to buy tickets is Tuesday…or Wednesday according to the Wall Street Journal. However, if you find a smoking sale don’t wait until Tuesday to buy. Those seats will probably go fast. The same flights may cost hundreds more on a particular date than it would be the day before or after. Many times I’ve moved my travel date either up or back in order to save money. If it really doesn’t matter if you start your trip on Saturday instead of Friday, then look at this option when booking your travel. What looks to be the cheapest fare may not be when you add in extra fees for luggage, headsets, blankets and more. If you’re going to check your bags this is a serious consideration. The fee for checking two bags ranges from $0 (Southwest) to $85 (Spirit). Don’t forget change fees if there’s any chance you might have to modify your plans. Again there is a huge range from nothing (Southwest) to $150. Airports in the same geographic area, or even the same city, can often have wildly different fares. One factor will be the airlines flying from the airport. Fares will generally be lower at airports with a discount carrier. Another variable is whether the airlines are receiving incentives to serve a city. The waiver of landing fees, terminal rent and other charges motivates the airline to fly from the city and saves travelers money. Instead of buying that expensive ticket to Chicago previously, I redeemed miles earned from previous travel and only paid the security fees. If you don’t fly enough to use miles consider a travel rewards credit card. Most frequent flyer programs have ways to earn miles by purchasing from partners ranging from florists to mortgage loans. These tips should help you find a better deal the next time you shop for airfare. How do you save on air travel? Buying airline tickets at a good price has become very difficult. Normally I do not use miles for domestic flights. Some routes are so expensive, it make sense to use miles. Some airlines offer deals with miles too. Checking sites like Kayak can help. Another option is to buy tickets on Southwest because the allow you to change your tickets free of charge. This means if the price drops you can cancel your existing tickets and buy the cheaper tickets. You have a year from the time of purchase to use the unused credits. Southwest and using airline miles are our preferred way. Which means I have to strategize well for my business trips to fly on either AA or United, or their partner airlines, and plan my trips in advance. The shorter the advance notice, the less choices I have. There’s an alternate airport in the vicinity to where I live, but nowadays you have to make a connection at the primary airport anyways which is completely silly from a time management perspective. @ Krantcents, Kayak is my go to site for researching airfares. Too bad, Southwest doesn’t allow it or sites like it to display their information. @ Craig, I do like the flexibility of changing travel plans with Southwest. @ 101 Centavos, good point about trying to fly the same airlines. I try to, but price trumps preference sometimes. @ Money Beagle, it’s a waste of time but $200 per ticket might be of more value than time. It’s a trade-off definitely. I refuse to change planes more than once domestically. These are good tips. To be honest, anymore I avoid flying as much as possible. I just can’t handle the hassles and the added fees. When possible, I drive and quite enjoy it! These are excellent tips. I’m driving to California to drop off my mothers car to my sister and then flying back to Chicago. We all know how costly 1 way tickets can get. I waited and found a southwest flight for $140! They were having a huge sale. What I found interesting is that if I wanted to leave the airport and hour earlier for the same flight, it would have cost me and extra $100! So fly at the off hours, it will save you lots of cash! All good tips. I think an underrated one is the alternate airport approach. I live in suburban Chicago, but on a few occasions have booked a flight from Milwuakee. It’s a futher drive for me, which does account for extra time and gas expense. However, I’ve gotten a couple of really good deals on flights, plus parking is cheaper in a smaller city’s airport. So as I alluded to, there are other costs associated with going to alternate airports, but overall they can – in certain opportunistic situations – provide a better, lower-priced alternative. We also have an alternative airport, but we’ve noticed it costs us an extra $60 in toll roads, gas, and meals per trip to do that. So we figiure in that cost when deciding. In winter weather we don’t fly from there as the drive could easily be longer with a higher chance of a missed flight. 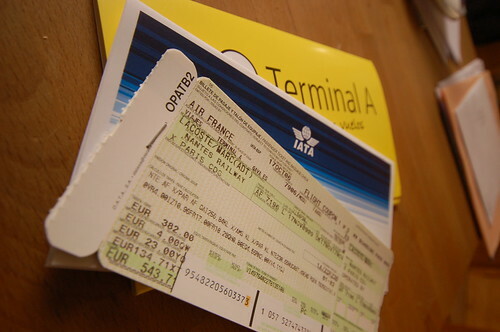 Kay, great tips on ways to save on airfare — we just blogged about a similar topic (Real Cost of Flying). As you discovered, it’s no longer early bird gets the worm, it’s all about yield management (more like yield maximization). Not sure how practical it’ll be for your situation, but Midway airport is a good alternative to O’Hare. @ Denise, I have family members that prefer driving but I don’t like car trips more than a couple of hours. @ Max, great point about being flexible about departure times. When booking business travel, we often have to buy the more expensive flight because it’s not possible to leave after the meeting. @ Squirrelers, I forgot to mention adding in the parking costs to the trip. It really can make a difference if you’re gone for more than week. We sometimes take a car service or shuttle for longer trips. @ CreditDonkey, thanks for linking to your article. I’ve be changing planes at Midway later this summer on a Southwest Flight. For the Financial Blogger Conference I used miles so will be in/out of O’Hare. I also tend to buy the tickets early. If you find a price you think is good, buy it. Excellent tips! I’ve always made it a point to buy on Tuesdays and often check back later just to see if I’ve actually saved much. More often than not, the savings are visible and well worth spending my lunch break booking a flight. I also agree with rewards credit cards, but it is important to note that the interest rates for rewards cards are generally slightly higher so it’s best to pay off the balance monthly – that’s what I do. There are so many additional fees for traveling these days that any small way to save can make a difference. Thanks for the helpful information! I’ve found that if I check prices too often for particular dates the prices go up at most of the airlines for those datesl. At some point the airlines’ computers seem to decide that there is more demand for those slots and raise prices. I can’t prove it, but it seems to be in response to my many checks on the prices. If I wait for a couple of weeks the prices go back down again. It’s all about supply & demand. As others have said, if you find a good price grab it! I have been wanting to go travel but tickets are too expensive! How I wish cheap flights would be offered every so often. Previous post: Celebrate Independence Day!